An Appreciation: Sir Roger Moore, 1927-2017. Not long ago, I was talking with some friends about how your first James Bond movie inevitably ends up being your favorite. Or if not your favorite, one that holds a special place in your heart, despite whatever shortcomings it may have. And so it is for me and The Man With the Golden Gun. Is it the best Bond movie? No, not by a long shot. But to this very day, it’s one of my absolute favorites. I can watch it over and over — and have. 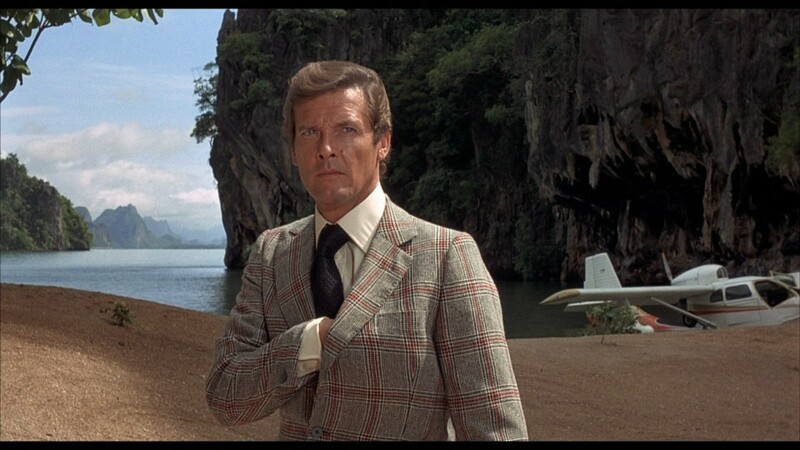 And so much of that is down to Roger Moore’s effortless cool. Yes, Sean Connery is the best Bond. Yes, Daniel Craig is the best actor. But Moore is my first 007 and I will always think of him fondly for it. 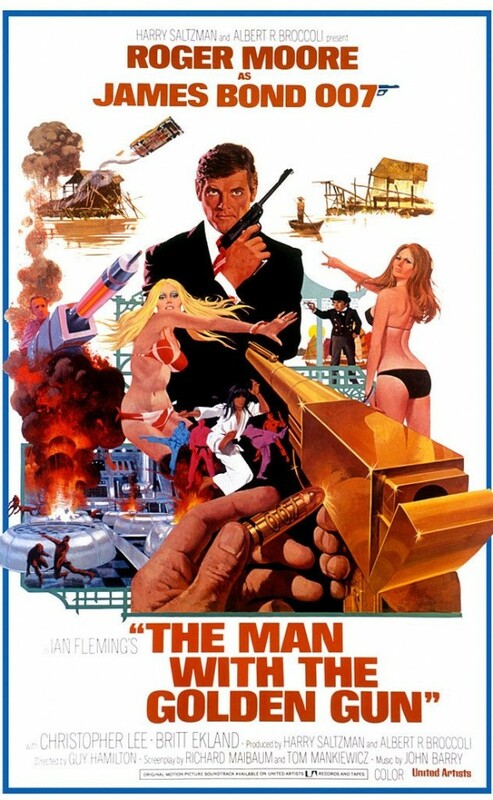 My Dad took me to see The Man With the Golden Gun in the theater when it came out in late 1974. I was 7 going on 8 and I was instantly hooked. I began writing my own James Bond “novels” and I’d buy used paperbacks at the local flea market. They were too complex for me to read at the time but I loved looking at the captivating covers. In the summer, I’d sometimes wear a blazer over my toy shoulder holster. 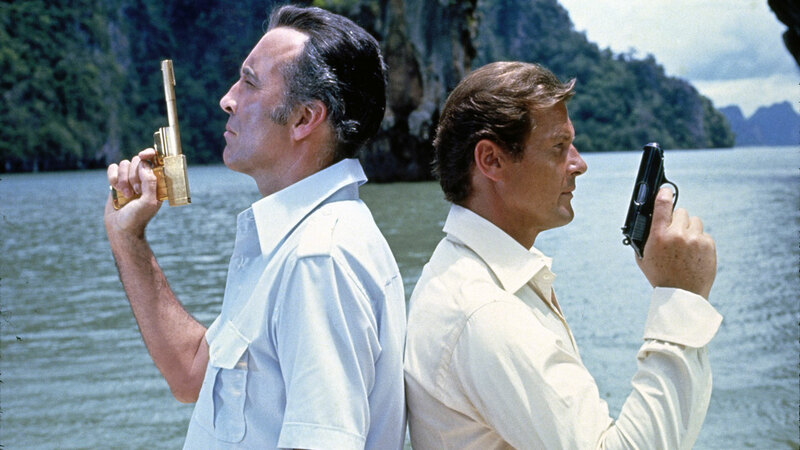 I was mad for Bond — and to this day The Man With the Golden Gun remains one of my all-time favorites, despite its detractors. That theme song featuring Lulu? Sizzingly brassy. Scaramanga? Christopher Lee‘s performance was incredibly influential on me. The exotic locations are alluring and exciting. (Khao Phing Kan — aka James Bond Island, where Scaramanga’s spectacular hideaway was located — is still near the top of my lifetime Must Visit List.) Britt Ekland remains one of the most beautiful Bond Women ever. 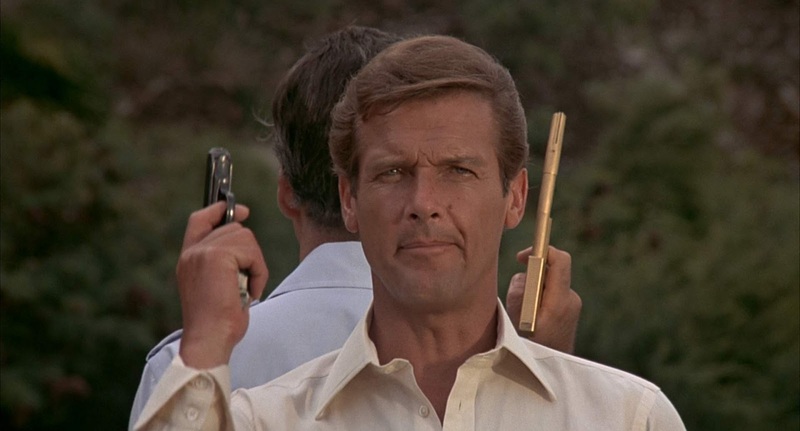 But holding it all together was Roger Moore and his winking, charismatic performance. This guy was cool. Going in, I didn’t understand that James Bond was a good guy. I was a Batman kid through and through and the Caped Crusader didn’t use a gun. Only the bad guys used guns. Ergo, I thought James Bond was a bad guy — and I didn’t understand why my Dad wanted to see this movie with a bad guy as the main character. I walked out a changed kid. I was thoroughly blown away by this suave secret agent and this world he inhabited. Now, I had two larger-than-life heroes to look up to: Batman and Bond. The next time my world was rocked so thoroughly was two and a half years later when I saw Star Wars. It’s funny how celebrity deaths affect us. We don’t actually know the person but we feel like we do because of who they are on screen. In this case, it’s even more bittersweet because, as my wife Wendy put it, Roger Moore actually seemed to enjoy having been James Bond. He got it. Sir Roger Moore was born Oct. 14, 1927. He’s died at the age of 89. I will miss him — but we will always have 007. For 13 POSTERS: A ROGER MOORE 007 Tribute, click here.